Daytona Beach, Fla. (Jan. 19, 2019) --- Delaware State’s bid for its first Mid-Eastern Athletic Conference win of the season went down in a hail of missed shots, resulting in a 69-49 men’s basketball loss to Bethune-Cookman at Moore Gymnasium today. The Hornets (3-13; 0-5 MEAC) connected on just 19 of their 74 shots from the field (25.7%), including five-of-26 on three-point attempts (19.2%). The overall shooting percentage was DSU’s second-lowest of the season, while the three-point percentage marked a season low. Bethune-Cookman (7-11; 2-3 MEAC) shot 43.9% overall for the game (29-for-66), including 57.1% in the second half (16-for-28). The Wildcats outscored the Hornets 39-25 in the final 20 minutes. Soufiyane Diakite recorded a double-double to lead BCU, scoring a game-high 20 points and grabbing 10 rebounds. Mark Gordon added 18 points, highlighted by three three-point field goals, while Cletrell Pope contributed eight points and 10 rebounds to the Wildcat win. 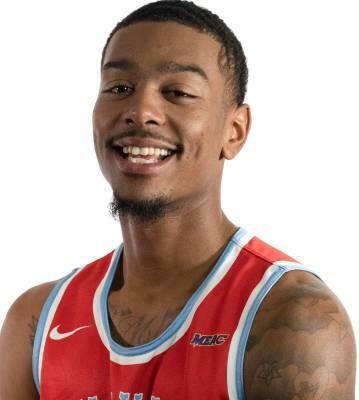 Kevin Larkin (Sussex Tech) was high scorer for Delaware State with 16 points, while Jonathan Mitchell came off the bench to add 10 points (3-for-5 3pt FGs) for the Hornets. D’Marco Baucum and Ameer Bennett led DSU with eight rebounds each. The Hornets pulled even at 20-20 after a lay-up by Larkin before Bethune-Cookman began to pull away. The Wildcats responded with a 10-0 run, and opened up a 30-20 lead on a three-pointer by Shawntrez Davis with 1:54 left in the first half. The Hornets scored the last four points of the half to pull to within 30-24 at the break. Bethune-Cookman ran off eight straight points early in the second half to regain a double-digit lead. The Wildcats led 40-28 after a dunk by Pope with 14:24 left to play. Delaware State answered with a 10-4 run, and cut the Wildcats’ lead to 44-38 on a Larkin lay-up at the 9:59 mark of the second half. Bethune-Cookman scored the next nine points to open up a 15-point lead. The Wildcats held their biggest advantage, 69-44, on a free throw with a minute to go in the game. BCU held a 50-46 rebound edge, while each team committed 13 turnovers. The Hornets will wrap up a two-game Sunshine State swing with a visit to Florida A&M on Monday (Jan. 21). The Martin Luther King National Holiday contest is set for 4:00 p.m., following the DSU / FAMU women’s contest in Tallahassee, Fla.